Populus alba is a member of the willow family (Salicaceae) that is native to Eurasia. It is a dioecious species and female mature trees can produce large seed crops. Populus alba spreads to new locations when mature trees release thousands of wind-dispersed seeds that may be carried long distances. It is an especially strong competitor as it can grow in a variety of soils and resprout easily in response to damage. Local spread of male and female trees occurs vegetatively via root suckers. According to Remaley and Swearingen (1998), Populus alba is a tall member of the willow family (Salicaceae) that at maturity may reach 21m or more in height and a little less than a metre in diameter. The smooth, greenish-white bark becomes dark and rough on older trees. Young green or brown twigs are coated with dense woolly hair, especially near the tip. A cross-section of the stem reveals a five-pointed, star-shaped pith. The 5 to 12cm long leaves are oval to maple-leaf in shape with 3 to 5 broad teeth or lobes; leaves are dark green above and covered with dense white hair below. Populus alba is chiefly planted as an ornamental for its attractive leaves of contrasting colour (Remaley and Swearingen, 1998). Populus alba can grow in a variety of soils but seems to grow best in full sun habitats, such as fields, forest edges, and wetland fringes (Remaley and Swearingen, 1998). It is a dioecious species and female mature trees produce large seed crops ( Dickman, 2001). Populus alba spreads to new locations when mature trees release thousands of wind-dispersed seeds that may be carried long distances ( Remaley and Swearingen, 1998). It is an especially strong competitor because it can grow in a variety of soils and resprout easily in response to damage. Local spread of male and female trees occurs vegetatively via root suckers. According to Glass (1990), P. alba appears to reproduce out of its native range primarily by vegetative means. Suckers arise from adventitious buds produced on the extensive lateral root system. Profuse suckers from the \"mother\" plant will form large vegetative colonies. Populus alba is chiefly planted as an ornamental for its attractive leaves of contrasting color (Remaley and Swearingen, 1998). It was introduced to the United States as an ornamental. 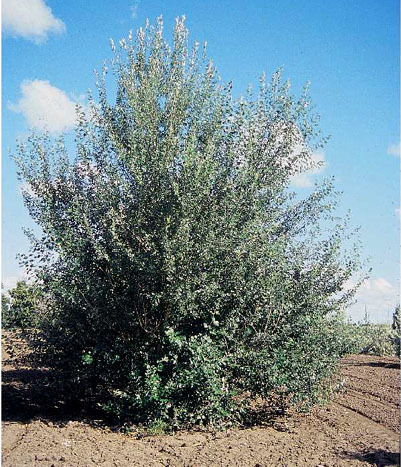 Recommended citation: Global Invasive Species Database (2019) Species profile: Populus alba. Downloaded from http://www.iucngisd.org/gisd/species.php?sc=261 on 21-04-2019. According to Remaley and Swearingen (1998), Populus alba outcompetes many native tree and shrub species in mostly sunny areas and interferes with the normal progress of natural community succession. It is an especially strong competitor because it can grow in a variety of soils, produce large seed crops, and resprouts easily in response to damage. Dense stands of P. alba prevent other plants from coexisting by reducing the amount of available sunlight, nutrients, water, and space. Natural hybrids are reported between P. alba and P. grandidentata or P. tremuloides in USA ( Dickman, 2001). Physical: According to Remaley and Swearingen (1998), Populus alba can be controlled using a variety of physical and chemical controls. Removal of seedlings and young plants by hand will help prevent further spread or establishment. Plants should be pulled as soon as they are large enough to grasp. The entire root system, or as much of it as possible, should be removed to prevent resprout from fragments. Hand removal of plants is best achieved after a rain, when the soil is loose. Trees of any size may be felled by cutting at ground level with power or manual saws. Girdling, which kills the tree by severing tissues that conduct water and sugars, also may be effective for large trees, especially if accompanied by application of a systemic herbicide to the cut area. A hatchet or saw is used to make a cut through the bark encircling the base of the tree, approximately 15cm above the ground and deep into the bark. Girdling will kill the parent tree but may require follow-up cutting or treatment of sprouts with an herbicide. \r\nChemical: Chemical control of P. alba seedlings and small trees has been achieved by applying a 2% solution of glyphosate (e.g., Roundup) or triclopyr (e.g., Garlon 3) and water plus a 0.5% non-ionic surfactant to the foliage until the leaves are thoroughly wet. Use of low pressure and a coarse spray with large droplet size will reduce spray drift and damage to non-target plants. The cut stump herbicidal method should be considered when treating individual trees or where the presence of desirable species precludes the use of foliar herbicides. After cutting the tree near ground level, a 25% solution of glyphosate or triclopyr and water is applied to the stump by spray bottle or brush, making sure to cover the outer 20% of the stump. Basal bark herbicidal treatment is also effective throughout the year, as long as the ground is not frozen, and does not require cutting of the tree. A mixture of 25% triclopyr in an ester formulation (e.g., Garlon 4) and 75% horticultural oil is applied to the bark in a wide band around the base of the tree to a height of 30 to 38cm from the ground. Thorough wetting is necessary for good control; spray until run-off is just noticeable at the ground line, but not running off-site. Informations on Populus alba has been recorded for the following locations. Click on the name for additional informations. Glass, W. 1990. Vegetation Management Guideline: White Poplar. Illinois Nature Preserves Commission. Summary: A brief description of P. alba. Summary: A website that provides information on worldwide distribution on P. alba. USDA-NRCS (United States Department of Agriculture). 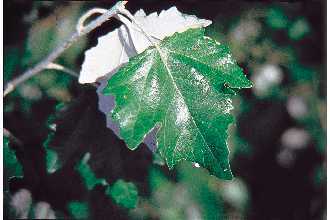 2002.Populus alba. Plants Database. Natural Resources Conservation Service. Summary: A database that provides information and links to all aspects of P. alba. Available from: http://plants.usda.gov/ [Accessed 23 July 2003].